For those of you who love the TV series, Game of Thrones (who doesn’t??! ), you will undoubtedly know that the Real Alcazar in Seville is used as one of the locations - the capital of Dorne, to be precise, seat of the House of Martell. Córdoba also has its Alcazar, but it has not, to my knowledge, been used as a set for Game of Thrones, but I wanted to grab your attention. Mind you, the Alcazar de los Reyes Cristianos in Córdoba doesn’t need to be part of a TV series to create drama. For a small city that seeps history from every pore, Córdoba has an almost complacent attitude to its monuments. That is no a criticism, as this is a beautifully preserved place, but these historic monuments are almost commonplace. The Alcazar is no exception. Similar to La Mezquita, this site was occupied in early Medieval times, and the main palace started in 1328, so only a mere hundreds of years here. As with many historic buildings, the Alcazar has a bloody history and was the centre for the first permanent tribunals of the Spanish Inquisition and as a headquarters used by Isabel I y Fernando, los Reyes Catolicos, in their campaign to rid the peninsula of the Muslim Nasrid dynasty based in Granada. As with all the sites we visited in our brief stay, there were no queues, no ghastly tourist stuff heralding the entrance - just a modest plaque and a gateway, and you are in the castle. The towers give great views over the city and the neighbouring Cathedral-Mosque on one side, and the Guadalquivir river on the other. They also give you a taste of what lies behind the fortifications: the gardens. These are stunning. 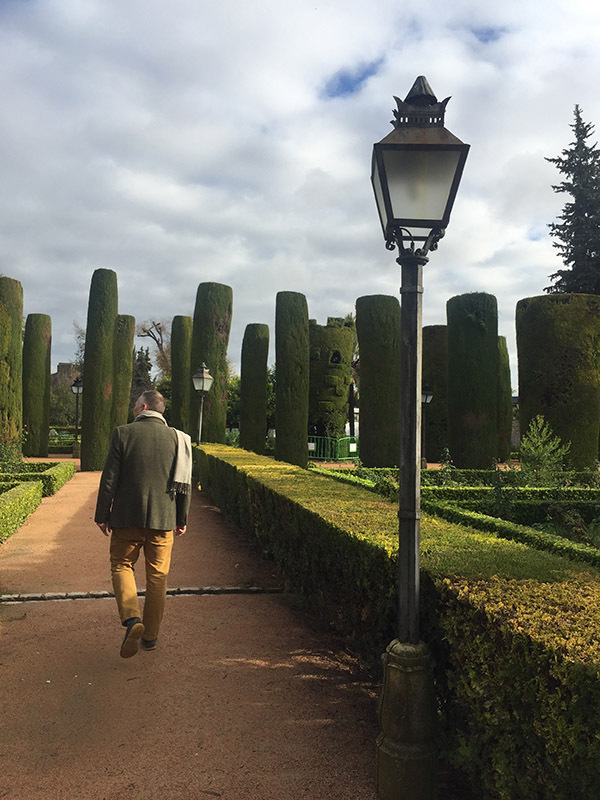 The gardens at the Real Alcazar in Seville, and the gardens at the Generalife Palace and the Alahambra are also stunning - there is no doubting that the moors knew how to design a garden. Water features heavily, and rectangular pools step gently down past cobbled pathways edge by cypresses and bed filled with flowers and shrubs. Even at this time of the year, there is colour and and a sense of drama and playfulness in the creation of space and vista. A courtyard at the back of the palace is filled with orange trees, and marble terraces at each end are punctuated by crystal-clear pools. This is a serene place, designed to take the edge of the intense summer heat. Isabel & Fernando were not amused. Beyond the immediate surroundings of the palace, the Italianate formality of the gardens takes you on a tour of neat low hedging, grand statues including a centrepiece of Isabel y Fernando, topiary, trees and flowers. We were transported out of modern-day Córdoba and into a world that has, seemingly, changed very little through time. Andrew is a lover of topiary, himself having dabbled as a topiarist in his time, so it is little wonder that this garden was, for him, a highlight of our visit, followed very marginally by the Cathedral-Mosque. I think we both agreed that Córdoba is a city that we love very much. It is very easy to navigate around; a city that invites you to wander through its network of charming alleyways and lanes, peek into the patios and courtyards that are celebrated every year with their own festival, become almost cavalier as you see another Roman mosaic in all its glory, or nip though a doorway to see a 14th Century Synagogue, just sitting there in the old Jewish quarter. We will cover more about some of the more quirky aspects of our trip in posts to follow, and we will certainly be back.